Among the individual potters the name and reputation of Susie Cooper stands high. Indeed this limited company has long passed the stage where the 'Studio Potter' produces upon a small scale. Nevertheless Miss Susan V. Cooper, R.D.I., F.R.S.A. is careful to preserve the remarkable 'personality' of her products. There is perhaps no pottery produced at the present day which so clearly shows the imprint of a single, directive, artist mind. 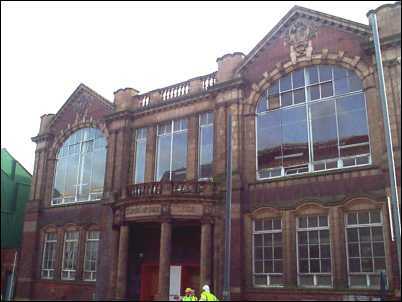 Miss Cooper studied the art and craft of pottery making at Burslem School of Art and was for some time Designer for Gray's Pottery, Burslem. But in 1931 the present company was founded to manufacture earthenware in Miss Cooper's own very individualistic style. From a small group of craftsmen and women it grew rapidly in pre-War years, until now it has become a thriving commercial concern. Although the factory was forced to cease operations during the war, it has recovered from this set-back, maintained its progress and, as its latest development, has formed a separate company for the making of bone china. At the present time, therefore, with both its well-known earthenware and its china in heavy demand, the future is faced in confidence. It is, perhaps, the premier producer of wares in the contemporary styles.